CREDIT: CanWest News Service A happy homeowner celebrates a sale with her real-estate agent. Housing affordability in B.C. has actually improved, thanks mainly to continuing low mortgage rates. That, says RBC Economics in its latest national Housing Affordability Index, is despite B.C. having the highest prices in Canada. Vancouver has the dubious honour of the country’s most expensive urban real estate. Despite this, the last quarter saw the city’s Affordability Indicator edge down to 44.3 per cent, which translates to an average monthly cost of $1,877, 1.1 per cent lower than the previous quarter. The Index, which RBC has compiled since 1985, is based on the costs of owning a detached bungalow, which is a typical target home for first-time buyers. The B.C. index fell to 41.2 per cent in the second quarter of 2003, from 41.7 per cent in the previous quarter. Despite a still dodgy provincial economy, B.C. continues to have the tightest housing inventory in Canada. Bob Rennie of Rennie Marketing Systems says the findings are not really surprising despite the ongoing heavy Lower Mainland housing demand. He doesn’t see that situation changing for at least the remainder of the year. Indeed, latest numbers show supply levels are at their lowest in 18 years, again hardly surprising given interest-rate levels are at a 45-year low. And all this comes despite a 15-per-cent surge in housing starts over last year. “As long as mortgage rates remain low, B.C. will likely register another solid year of housing activity thanks to the deep pool of pent-up demand,” says RBC economist Carl Gomez. But he cautioned that over the longer-term mortgage rates would eventually rise. When that happens, the market will only be sustained by a stronger economy, more jobs and income growth, he says. RBC says Canadian home ownership costs ranged from a low of $901 per month in the Atlantic region to a high of $1,570 per month in B.C. OTTAWA (CP) – Sales of existing homes shattered previous monthly records in July, the Canadian Real Estate Association says. However, July was also the first month since February that the average price did not set a record. Sales by agents on the multiple listing service in 25 major markets across the country rose by 14.5 per cent to 30,281 units from 26,444 in June on a seasonally adjusted basis, the association said in a statement Thursday. July sales surpassed the previous monthly peak of 27,859 units set in January 2002. The average price of resale homes in July stood at $225,122, an 11.7 per cent increase from a year earlier when it stood at $201,504. The association reports twice a month on MLS home sales, once on sales in 25 major urban markets and then on all markets. Time: the near future. You’re at the supermarket and your shopping cart is piled high. But there’s no need to stop at the checkout. Every can of cat food, each bag of nacho chips, every tube of Crest, and even that single pineapple carries a readable tag that’s recorded by sensors. Instantly, your order is scanned, totalled and — because those sensors can also read the debit card in your wallet — paid for. When you get home, another sensor detects the arrival of the groceries while they’re still in the bags. Each item is entered in a digital household inventory. Once you’ve Hoovered your way through a bag of nacho chips and its out of the house and no longer detected by the sensor, it’s deleted from the inventory and added to your grocery list. Oh, and if you’re worried about getting fat on those nachos, your scale will record your weight every day and store that securely and encrypted on your computer — along with other health information like your blood pressure or blood sugar. Then, just before you visit the doctor you can select the pertinent health stats and send them ahead. Okay, I can see you rolling your eyes. Here we go again with that futuristic tech pie in the sky, you’re saying. And just, where, exactly, Mr. Smartypants is that home gyrocopter we were all promised back in the 1950s? Fair enough. Tech happens, but never the way we expect. Today we have the likes of spam filters and personal digital assistants and WiFi hotspots — which might well mystify someone from the ’50s — but our garages still contain gas-guzzlers with internal combustion engines. This time, however, there might just be a better chance of things going as predicted. First of all, as we near the end of 2003 we are at a technological tipping point, where the advent of the WiFi home network has made something being called “the connected home” possible, even on a budget. No longer do we have to have homes wired from top to bottom to connect our computers to our printers to our laptops to our MP3 players to our digital cameras to our home entertainment centres to our cellular phones to our DVD players. Now, all we have to do is to set up a wireless network, based on 802.11 and Bluetooth technology, and add things as we need them. Look, Mom, no wires. And it is indeed Mom — for our second point — who is going to make all of this happen, at least according to the Internet Home Alliance (www.internethomealliance.com, a tech future-gazing mindmeld that includes the likes of IBM, Microsoft, Sears, Sun, Cisco, Westinghouse, General Motors, Hewlett Packard, Motorola, Samsung, Sunbeam and Bell Canada, all of which want a piece of that tech pie in the sky, if there’s any to be had. But women — who make 80 per cent of the purchase decisions in the home, added Woods — don’t want “cool,” they want tech that works intuitively and easily and benefits their family in some useful way — particularly if it improves their health or increases their safety. Otherwise, they walk away. That’s why the IHA’s first big experiment, Mealtime, which starts this month in Boston, is centred around the home. Twenty families will have a Sears-installed Whirlpool Polara stove — which both refrigerates meals and then cooks them — installed in their kitchens, along with a Whirlpool fridge and Web tablet. Utilizing an IBM system to integrate the technologies, the families will be able to put a meal in the stove the night before and arrange to have it kept refrigerated and then cooked at a set time the next day. From a cell phone, the mobile tablet or a Web-enabled entertainment/command centre, the family can adjust the schedule or cancel the meal entirely. In turn, the family can even call the oven from the cell phone to turn it off. The special command centre provided by Icebox will allow family members to surf the Net for coupons, create shopping lists and even e-mail the lists to an online grocer. There’s a special kitchen-oriented printer from HP. Oh, and the keyboard in the kitchen is washable. Just put it under the tap. – Kitchen: As in the IHA Mealtime experiment, food preparation and storage will change. Now that your house tracks every grocery item in it, you can ask the kitchen computer to put together recipes to suit what you have available. At the same time you’ll know that you can’t make a certain dish, because you’re out of oregano. Also, if you have a fridge that, say, keeps a list of food as it goes in and out, you’ll always know if you left the milk out on the counter too long. The same with meat and vegetables. Oh, and the fridge, if you remember to store the milk in the proper place, might weigh it to tell you you’re close to being out and automatically put it on the grocery list. And all of your appliances will have their operations accessible through a Web page. If something’s gone wrong, at least you’ll know what it is, even if you can’t do anything about it. – Health: It’s one thing to have your blood pressure recorded, but quite another to be wired up as you sleep. This could be done occasionally to check you for an extended period of time, monitoring things like respiration, heartbeat and even detect if you’re suffering from night sweats. It will detect current problems and predict those you might face in the future. – Security: A home alarm can help protect you from break-ins and fire sensors awaken you when you’re in danger, but motion detectors might also note your location in the house. This means that when fire trucks arrive they can connect with your alarm system and find out the last location of everyone in the household. Also sensors can tell the firefighters where the fire started and how far it has spread, and where the structure of the house might have been damaged to the point of being dangerous. – Entertainment: Your music, digital images and movies will follow you everywhere. The minute you walk into your home, devices like your PDAs, phones, MP3 players, digital cameras and video recorders will start downloading new content to the home system. If you have a new video of Susie’s soccer practice, it will be downloaded for viewing that night or later. MP3s downloaded from the Net by Johnnie that afternoon can (if you want) be loaded on to your MP3 player. And it’s likely the various songs, films and digital images you were carrying with you were also loaded into your car’s entertainment system as you drove home. You no longer have to drag people into your home office to look at photos, say, because now they can view them anywhere, even in the kitchen. (One thing that the IHA has discovered in its research is that while portable memory, in the form of those slide-in compact memory cards we use in cameras and PDAs, has become common, the average person doesn’t realize it can be shifted from device to device. We’ll know it soon, because that kind of memory will be as common as batteries are today. – Home Office: It will no longer be in one spot, but will travel to where you are. Sure, you can do that already with the laptop, but even the lightweight LCD screen with your desktop computer will move with you and you can use touch to operate it without a keyboard. As well, wherever there’s a screen, like the big one with your home entertainment system, you can call up information from the central computer or server. How you’ll deal with those inevitable piles of paper that pile up wherever a computer resides will be your problem. Voice Activation: As voice technology improves, commands for household appliances, computer systems and even things as mundane as lighting will be done with the voice. The cat, however, will still not pay attention to you. Computer security and encryption: As with everything, there’s a downside to all this new technology. Every time you add a function, you create a chance for it to go wrong or be, well, subverted. You don’t want your personal health information flowing to just anyone and you don’t want the teenager next door to be able to turn your oven on and off at will. This means that security is going to have to be much better than it is today. Spurred by rising demand and dwindling inventory, new house construction in Greater Vancouver jumped 46 per cent in July compared with the same month a year ago, while property sales soared 50 per cent, driving up house prices. “This is an exciting time for both builders and consumers,” said Charles King, chief market analyst for Canada Mortgage and Housing Corp. in Vancouver. “Consumer confidence in residential real estate has been ignited by low interest rates. Today, home ownership continues to be within the reach of most pocketbooks. Figures released Monday by CMHC show construction started on 1,691 new homes last month in Greater Vancouver, compared with 1,161 units in July 2002. Through the first seven months of 2003, a total of 8,019 new starts was recorded in the region, up 15 per cent from 6,994 units the previous year. Despite the construction boom, developers still can’t keep up with demand, as the number of active listings in July fell 20 per cent year-over-year to 9,325 units, down from 11,769 units. Realtor Bob Rennie said that pre-sales have been so hot, there are fewer than 200 condominiums left for sale in the some 19 projects that are still under construction in downtown Vancouver. (Five-year, fixed-term mortgages are currently available at rates below five per cent). Between May and July, it took Rennie less than eight weeks to sell out all 456 units at the Electric Avenue condo project, being developed by Wall Financial Corp., in the 900-block Hornby. At an upcoming Wall project, called the Hudson at Granville and Dunsmuir, Rennie already has more than 140 prospective purchasers on the priority waiting list for the 427 suites, a month before the sales launch. Over on the North Vancouver waterfront, Rennie recently sold 93 of 117 units at Millennium Group’s One Park Lane, at West First and Chesterfield, in less than three weeks. “The dynamic spot isn’t just downtown, it’s everywhere,” said Rennie, who sold $127 million worth of properties in 2002 and expects to far exceed that dollar volume this year. 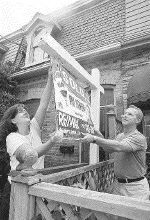 In July, Multiple Listing Service data showed a total of 4,023 detached houses, townhomes and condos changed hands in Greater Vancouver, the first time that more than 4,000 units sold in a single month since March 1992, at the height of the sizzling market largely fuelled at the time by Asian immigration. By comparison, in July 2002, a total of 2,670 units changed hands. Condos and townhomes were the hot tickets last month, with sales climbing 62.6 per cent and 61.3 per cent respectively over the same month last year. The average MLS price of a detached house in Greater Vancouver rose 9.8 per cent in July to $428,600, up from $390,500 the previous year. Condos sold at an average price of $214,900, an 8.7-per-cent increase over $197,700 in July 2002, while townhomes fetched an average of $271,200, an appreciation of four per cent over $260,800. On Vancouver‘s west side — which includes the downtown area — condo sales nearly doubled last month with 692 units sold, compared to 357 units the previous year. The January-to-July average price of $273,500 was 7.3-per-cent higher than $255,000 in 2002. In addition to first-time purchasers finding home ownership attractive because of record-low mortgage rates, King noted that residential property is now preferred by investors as a safe alternative to volatile stock markets. A recent CMHC study indicates about 50 per cent of all condos built in downtown Vancouver during the 1990s were bought by investors. “It appears that this trend is still evident,” King said. Across B.C., 2,715 new housing starts were recorded in urban areas for July, up 41 per cent over the same month last year. From January to July, province-wide housing starts rose 20 per cent to 13,018 units, with multiple (condos and townhomes) starts climbing 27 per cent to 6,691 units, and single-detached starts increasing 13 per cent to 6,327 units. Along with the Lower Mainland, the leading B.C. markets in terms of growth this year are in Greater Victoria, Kelowna and Abbotsford. You are currently browsing the Les Twarog Vancouver Real Estate and Condo Blog blog archives for August, 2003.